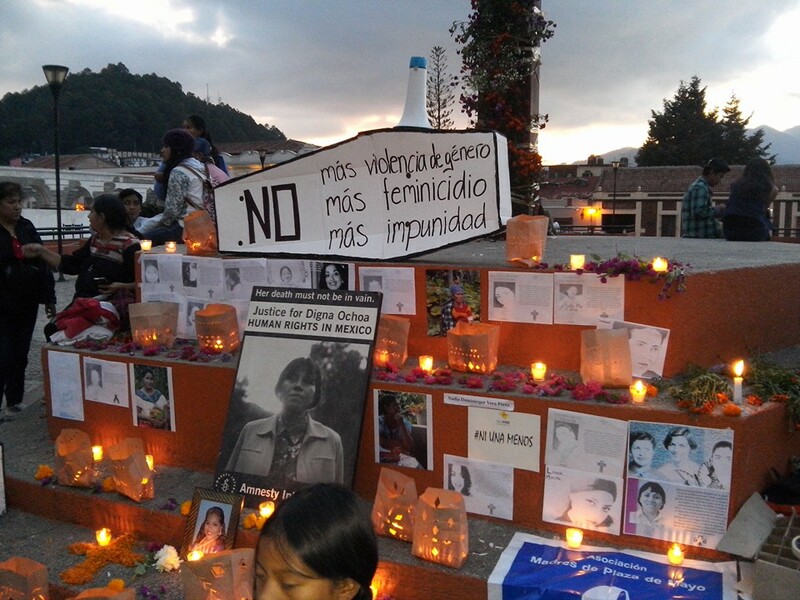 Altar of the Popular Campaign against Violence against Women and Femicide in Chiapas. Photo credit: courtesy. In observance of the Day of the Dead, several organizations and collectives organized commemorative events in San Cristóbal de Las Casas. 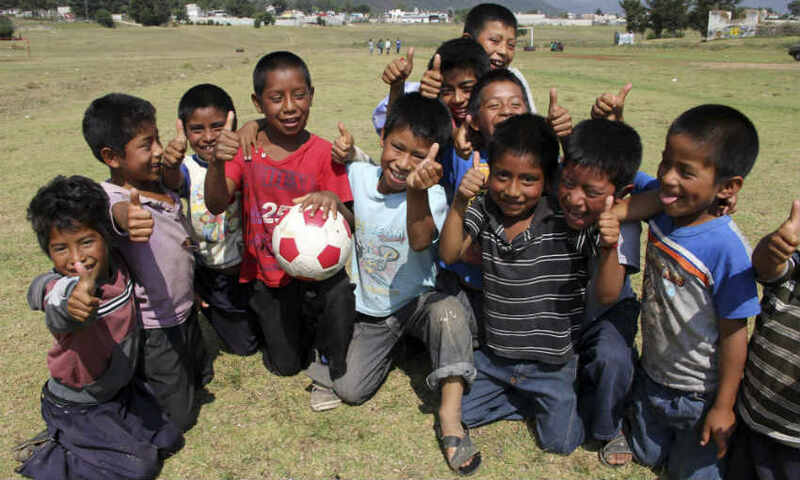 For one, Melel Xojobal, a civil association that works to promote, defend, and exercise the human rights of children and youth through participatory processes, organized an act against child mortality due to discrimination, violence, and poverty. With slogans such as “they should not die” protestors marched through downtown, where they installed an altar with information regarding several cases and statistics on child mortality in Chiapas and Mexico. “We do these marches to raise our voices, so that people come to realize that the government does nothing, that when something happens to children or youth, impunity remains,” said a youth protestor. For its part, the Popular Campaign against Violence against Women and Femicide in Chiapas also installed an altar. Using photos of femicide victims, both from the state as well as from other parts of the country, they commemorated the victims of violence against women and demanded the end of the violence against women and female human-rights defenders. For her part, Lourdes Almada from the Network of the Rights of Infancy in Ciudad Juárez spoke to the impact that the “war on organized crime” has had on infancy and adolescence in that city. Almada observed that between 2008 and 2010 were killed close to 7000 people, of which more than 400 were minors of age; it is estimated that 13000 children have been made orphans. 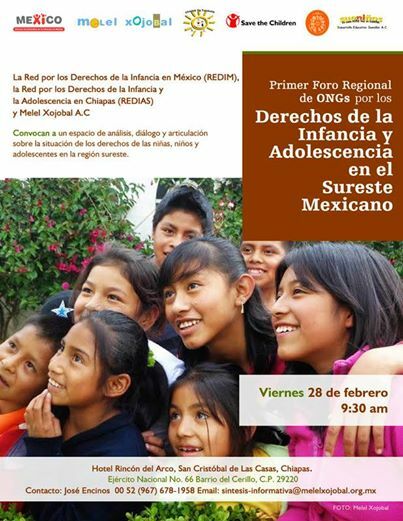 In the third intervention, Patricia Carmona from Mexican Agency of News for the Rights of Infancy (AMNDI) presented data from her editorial analysis of media published in the country regarding the rights of children and adolescents that was published in alliance with the program Infancy and Movement. The types of violence most reported in the state daily newspapers were domestic violence in the first place; violence in the community and school in second and third place; violence perpetrated by organized crime in fourth place; and sexual violence and commercial sexual exploitation in last place. To close the event Rosa Poiré Castañeda, from the organization Save the Children Mexico, spoke on the challenges of building spaces free of violence with children and adolescents.